This is a grand and long lived tree, achieving both height and breadth through 200-300 years. Ideal for lowland and dampish areas, it does better on more level surfaces. It tends to be too heavy for slopes and suffers the same blow-down fate of firs on shallow soil surfaces. It is lighter in color than firs, and with scaly leaves rather than needles. 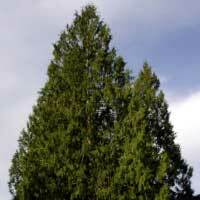 Unlike firs which can be pruned up to allow access below, the Cedar is better if grown with branches from the ground. It's heavy quality will simply drop the lowest branches down anyway and be less attractive. So give it a 20' spread area although it will take a couple decades to achieve this breadth. Like the fir, it is not good to top these trees, but if started when young, it makes a surprisingly handsome and slow growing hedge.